25-Dec-2001 -- My brother Henrik and I started from Umeå at 10 am on Christmas day and drove west in an attempt to reach the secondary confluence point 64N 19E. 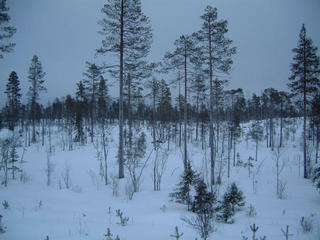 The weather was overcast with a light snowfall and about 9 degrees centigrade below zero. When we reached Bjurholm after about 60 km, we took a local road along the river Öreälven to a little village called Västerås. Here we turned left onto a logging road. After about one km it was not longer cleared from snow after the latest snowfall. But it was not more than 10 cm snow on the road, so we had no trouble driving on it. After about 6 km we came to the end of the logging road. The area was newly clear cut and log piles was still lying here and there. From the end of the road it was only 227 m left to the point. So the last part we went on skis. It was slightly uphill and easy terrain, so it did not take long to reach the point. It was quiet at the place and we did not see any animals. On the way back however we met a hunter who was looking for his dog. #5: Eye of a tame moose at a nearby moose farm.